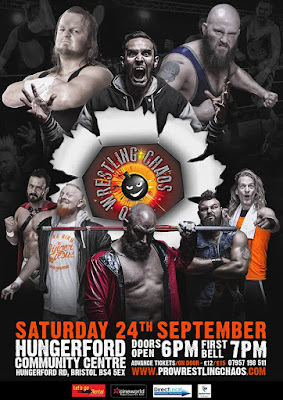 The weekend is on it's way once again, which means it's time to look ahead at what the British wrestling scene has to offer as we see out September with a bang and an almighty line-up of shows. First off we look at what Fight Club: Pro have to offer in Wolverhampton, West Midlands on Friday night, before heading south for Pro Wrestling Chaos in Bristol on Saturday, before closing things off with the biggest wrestling show England has seen for many years, as PROGRESS Wrestling take over Brixton, South London on Sunday! Right, now you know what's in store, we better get your ready for it, eh?! None of those near you? Don't worry, we've added a couple of alternatives for each day! There's big shows in East Kilbride, Nottingham, Preston, Ayr and Birmingham, with the likes of Zack Sabre Jr, Mark Coffey and Noam Dar, so you'd be a fool not to get to your nearest show this weekend! 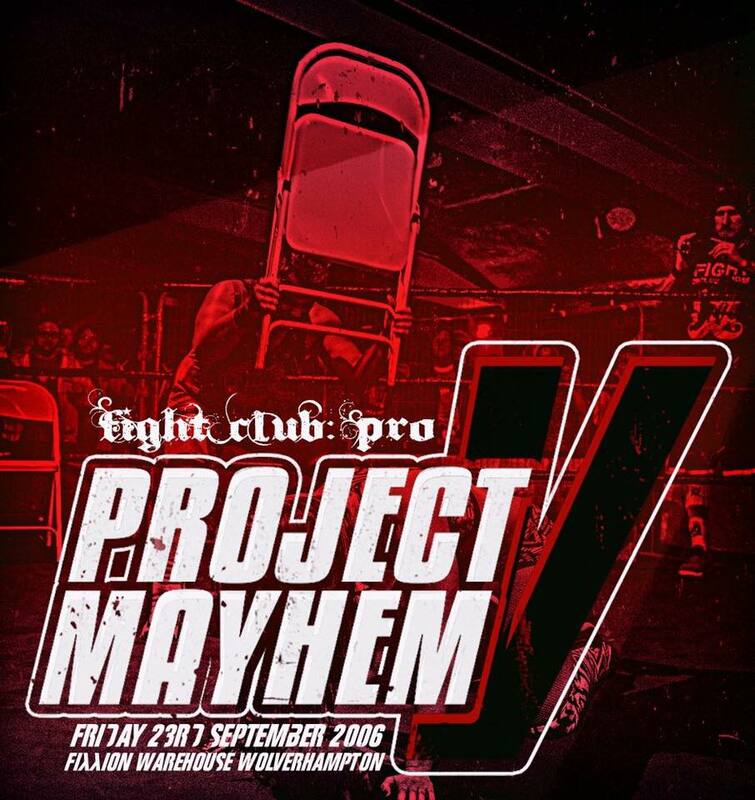 Following last month's International Tekkers: The Beginning of the End, Fight Club: Pro's September show promises to be another hard hitting night of British Strong-Style action, as Project Mayhem V celebrates the companies seventh anniversary at Fixxion Warehouse in Wolverhampton, West Midlands. To say that relations between Chris Brookes and Clint Margera have become heated over the last three months, would be an understatement. After battling in an impromtu No Disqualification match at Rage Against the Death Machine in July and then taking things up a notch at International Tekkers: Beginning of the End in an "I Quit" Chain Match in August, Brookes and Margera look set to take their extremely personal rivalry to an entirely new level, by allowing fans to bring their own weapons. After The Calamari Catch King kicked Margera's girlfriend in the face to finally push the Death match specialist over the edge last month, it's safe to say that Margera desperately wants to hurt Brookes and with the former Infinity Trophy winner not exactly a fan favourite, Fixxion Warehouse won't be the most friendly of places for Brookes come Friday night. Who knows what kind of creativity Wolverhampton possesses, but I've got a feeling we'll be finding out soon enough! Another rivalry that has been running wild in FCP is the battles between Lee and Jim, The Hunter Brothers and the comparatively inexperienced pairing of Dan Moloney and Wild Boar, The Face Smashers. The teams traded victories at Infinity and All the Best in December 2015 and February of this year respectively, before things became even more violent in April when the four appeared to destroy the Planet Nightclub at Planet Terror Vol. 2, with no official result given because the two teams ended up fighting anywhere but the ring! If the two teams had problems before, then Boar package piledriving Jim off a bar and through the merch table, leading to Jim having to helped out of the venue and requiring surgery, in July at Rage Against the Death Machine, when the teams were schedule to have two singles matches against each other, has made things much much worse. It's clear that Jim and Lee are out for revenge on Friday and with the fourth match being aptly scheduled as a Tables Match, they have the perfect opportunity. On the other hand, Moloney and Boar will be looking to build on their massive victory over former ROH World Tag Team Champions War Machine last month and finally put to bed one of the longest running feuds in FCP. Also on the show, Travis Banks continues to look for his first win in FCP in a Two Out of Three Falls Match with Tyler Bate and in a rematch from August, Nixon Newell takes on former TNA Women's Knockout Champion, Jessicka Havok! On Saturday, Pro Wrestling Chaos shall be at the Hungerford Community Centre in Bristol with their The Hungerford Games event. The show shall see the continuation of the Knights Of Chaos Championship tag team tournament with one of the semi-finals taking place. This semi-final will see Alex Steele and Eddie Dennis, known collectively as Steele Dragons face The Hunter Brothers. Both of these teams have had the crowd behind them each time they have competed in the tournament so a divided crowd could well make an appearance this Saturday. Whoever does progress to the final shall be facing The Swords Of Essex so another challenge awaits the winners. Both teams only have one shot at getting to the final and they'll have to show why they deserve it more than the other. At Choose Your Weapon last month, there was a tag team match that involved Roger The Cabin Boy and Panda Cub. During the match, a video played by "Flash" Morgan Webster where at the conclusion, they both attacked their respective partners before leaving in silence. Since then nothing has been said except for the fact that Roger The Cabin Boy now wishes to be known as Danny Jones. These men seem to be on the same page and with that being the case, PWC have signed a tag team match with Jones and Cub facing Jezz Gardner and Matt Horgan of The Pure Breed. Pure Breed are a product of the Dragon Pro Wrestling Academy, just like Cub and Jones. No one knows what is going on with Cub and Jones but Horgan and Gardner have known them since they began training and probably know them as well as anyone. The question is, do Pure Breed have the knowledge to understand what is happening with Cub and Jones and are they able to combat it? Or are these two men now no longer the same as the men Pure Breed once knew? The main event this Saturday in Bristol shall see international star and former wXw World Tag Team Champion, Sami Callihan make his PWC debut. At Choose Your Weapon, Wild Boar was scheduled to defend the King Of Chaos Championship against Dave Mastiff. However, due to injury, Boar was unable to compete. General Manager, Jimmy Havoc agreed with Boar that he would allow him to keep the championship despite being unable to defend it on the condition that he would be challenged by Callihan. Boar agreed to the match and in doing so has possible given himself the biggest challenge of his career. Boar has a brutal almost animal-like edge to his offence and it is what what has made him such an intimidating competitor. Callihan also has that style of offence, meaning that Boar will possibly be meeting his first opponent that has similarities to himself and it will be a real test for the champion. Boar has fought anyone who has challenged him and defeated the likes of Johnny Gargano and Pete Dunne in his championship reign, this Saturday will be the biggest test of his reign and one of the biggest of his career. Callihan will find out that Boar is an animal in the ring and likewise Boar will be bound to discover that “The Death Machine” isn't just a fancy nickname. PWC could be seeing it's most violent match to date in Bristol this Saturday at The Hungerford Games. Also scheduled for The Hungerford Games is Mike Bird going up against a mystery partner selected by Pariah Khan, whilst "Pastor" William Eaver, "Mr. Massive" Chuck Cyrus and Kelly Sixx are all scheduled to appear. 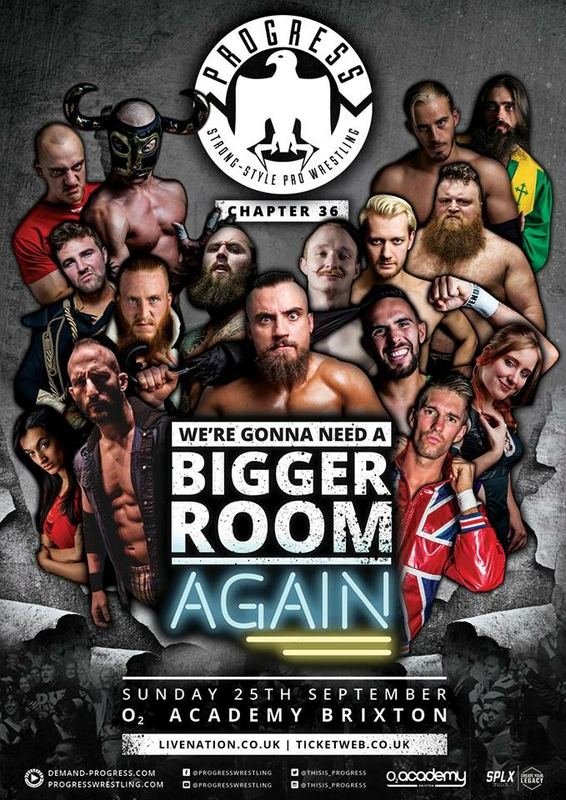 It's the biggest show that England has seen in, at least, a generation as PROGRESS Wrestling presents Chapter 36: We're Gonna Need a Bigger Room...Again in O2 Academy in Brixton, South London with a stacked seven match card. Showcased in a brilliant hype package on social media, Zack Sabre Jr and Tommaso Ciampa's rivalry has been building and building since they clashed in the Quarter Final of Super Strong Style 16 in July 2015 at Chapter 19, in what was regarded as one of, if not the best match of the highly acclaimed tournament as ZSJ came out on top. Things would escalate in a rematch that December at Chapter 24: Hit the North with Ciampa getting his win back, but despite battering each other repeatedly, things would remain relatively friendly until Chapter 27: The Lost Art of Suffering in March this year, when following an unsuccessful challenge for the Tag Team Championship, Ciampa laid out The Technical Wizard before laying down the challenge for Chapter 36. These Cruiserweight Classic competitors have stolen the show together before and with the rubber match being made Two Out of Three Falls, they'll have three times the opportunity to steal the biggest show in PROGRESS to date, all whilst beating up their most bitter rival! 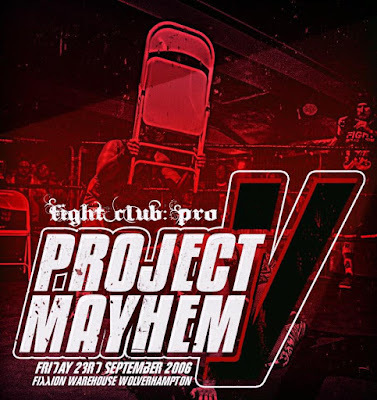 The Origin consists of Nathan Cruz, El Ligero, Zack Gibson and Dave Mastiff and they've been causing all kinds of problems for PROGRESS since the Summer of 2014, taking on a number of different aliases until the group we recognise today was formed. With so much history it was inevitable that the villainous foursome would collect a number of enemies along the way and this Sunday four of those enemies may cause the downfall of the group as we know it. As The Faceless, the group took the Tag Team Championship from Eddie Dennis and Mark Andrews, known as FSU, they'd later clash in titles rematches in January and April as well other tag and singles matches, with Cruz & Ligero always having a trick up their sleeve to remain champions. Damon Moser was initially a member of the group, but having been kicked out fairly early on, he's made it his mission to destroy his former stable, including taking part in a vicious No Disqualification Match with Cruz in June. Cruiserweight Classic competitor Jack Gallagher has defeated Origin members on three consecutive PROGRESS Chapter shows, so Moser will be hoping that Gallagher is the lucky charm that will lead to the group's demise, before The Extraordinary Gentleman heads of to join the Cruiserweight Division on RAW! These two sides are going to go to war with each other and once the dust settles PROGRESS may be a very different place indeed. 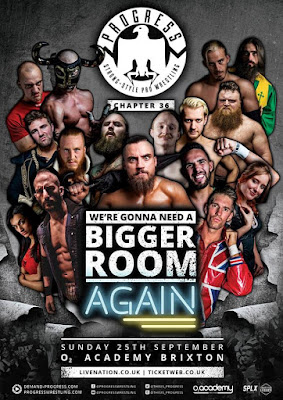 Chapter 36's main event is a Three Way Dance between three of the World's premier wrestling talents as Marty Scurll puts his World Championship on the line against Mark Haskins and Tommy End. Both challengers are no stranger to the title picture, with the pair coming as close as you can to winning the belt without getting to take it home, putting on PROGRESS classics in the process. Both challengers have proved that they belong in the promotions upper echelon, with Haskins repeatedly beating top talent to become Number One Contender, including winning the 2015 Thunderbastard match, whilst End has won Super Strong Style 16 and even defeated Scurll in a non-title match this year, only to be screwed out of the title thanks to an interfering Mikey Whiplash and other nefarious Scurll shenanigans. Whilst the challengers didn't exactly need any other reasons to wrestle the belt from Scurll's grasp, we've seen The Villain commit atrocities to both as he attacked Haskins wife in February and cheated to defeat End not once but twice in their last meeting. When these three make their way out to the ring on Sunday, there will definitely be a big match atmosphere inside the O2 Academy, but will that atmosphere help drive one of PROGRESS' nearly men to winning their first PROGRESS title and get vengeance on Scurll or will The Villain do what he does best and find a way to win, by any means necessary? Sunday, Brixton, O2 Academy, be there or you'll regret it forever. The show also features the Final of a tournament to crown the inaugural Atlas Champion in a division for those over 205lbs as Joe Coffey clashes with Rampage Brown, British Strong Style (Pete Dunne and Trent Seven) challenge for The London Riots' Tag Team Championship, Pollyanna, Nixon Newell & Laura Di Matteo team up against Alex Windsor, Dahlia Black & Jinny and "Pastor" William Eaver gets his hands on the man that cost him the World Championship two months ago, Sebastian. Opinion: WWE - How Much is Too Much?